I worked up this composition from a small oil I did some months ago. In this large version there is much more depth and power throughout. 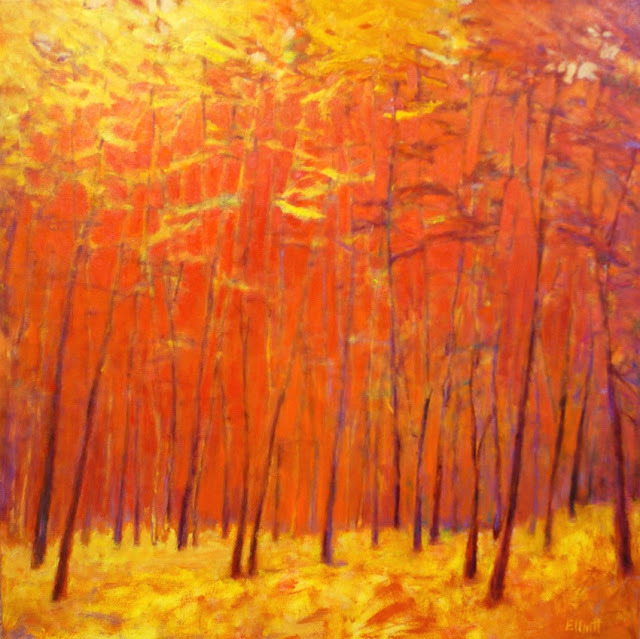 After going through a lot of permutations, I came back to this simple arrangement that allows the best interplay of the reds, yellows and contrasts of the trees. This oil has been in the studio for a couple of months and it underwent a lot of painting sessions, but the work remained fresh and kept its subtle power. I'm assembling the progressive photos of this oil into a little presentation that illustrates how this painting came together. I'll post it here in the next few days. Hello there, Ken. Just love the richness of these colours and specially the very, subtle purple highlights on the trees !! thank you Carole! What a lovely you in the hat photo. Where can I see your works?